Goalkeeping coach Paul Mathers will not be joining Jack Ross’s Sunderland staff – after deciding to stay with Scottish Premiership club St Johnstone. Ross is reshaping his backroom staff following the departures of goalkeeping coach Adrian Tucker and first-team coach Robbie Stockdale earlier this month. But former Dundee and Falkirk keeper Mathers, who was also attracting interest from near-neighbours Dundee United, is set to stay with the McDiarmid side. St Johnstone boss Tommy Wright told the Scottish Sun: “Paul has told me he is staying, which is great news. “He is an excellent coach and someone we didn’t want to lose. We had a good chat and there is an agreement for him to sign a new contract. Wright hit out at the Sunderland boss last week after claiming that he wasn’t spoken to by Ross before talks got underway with Mathers. The Sunderland squad returns to training on Wednesday, with the club hoping to appoint a goalkeeping coach soon. Meanwhile, Didier Ndong’s future still needs to be resolved. Sunderland accepted a £6.6million bid from Torino for the midfielder (pictured) earlier this month but the move collapsed. Reports in Italy, via Calcio Mercato, now suggest one of the reasons why Ndong’s move fell through was due to the demands of his representatives, who wanted a fee in excess of €1million for helping broker the deal. 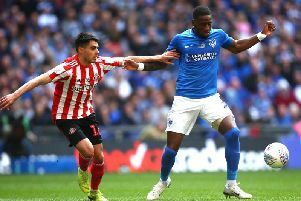 It remains to be seen whether a move to Italy can be resurrected, while Premier League new boys Cardiff City have been credited with an interest in the 24-year-old.